Traditionally, a large number of the Gondhali were oil-pressers. Today, their primary occupation is farming, and some operate small businesses. 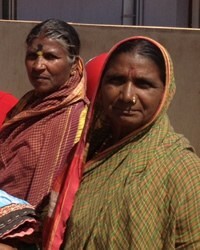 The Gondhali have seven clans (gotra), whose names are different than their surnames. Their women are highly proficient in sewing, embroidery and knitting. A Brahmin priest usually performs death rites. They worship Khandoba and Ellamma. In Maharashtra (the main home of the Gondhali people), Christians struggle with nominalism. Infighting and legal squabbles have crippled ministry and undermined witness. These issues do not provide an attractive testimony to communities such as the Gondhali. Perhaps some of the Gondhali people will discover Gospel recordings and videos on the internet. Pray they will be drawn to these, will listen and view, and understand. 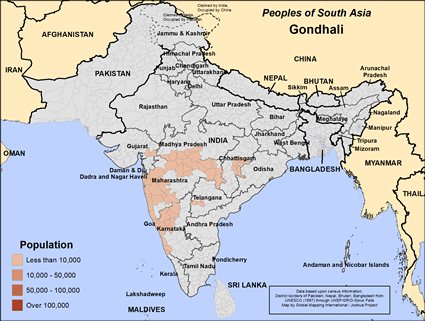 None of the Gondhali have reported themselves as Christians to the census of India, but please pray for those who will soon make a commitment to Jesus Christ as Lord and Savior. Pray the Gondhali people will encounter Christians who are real disciples of Jesus, people who live out their faith and are able to help the Gondhali also become disciples of Christ. View Gondhali in all countries.